When we spend time in the wilderness, it can be tempting to focus our awareness on “doing” something: taking pictures; getting a certain amount of physical exercise; traveling from point A to point B; naming all the species of birds we encounter. While nature photography is a lovely craft, and we need to exercise for good health, and understanding what lives in our environment is a valid part of deepening our relationship with the land, these activities can separate us from a more intimate experience of the natural world. It is all too easy to forget to actually experience with all our senses that which we are busily capturing and identifying. The natural world invites us out of our world of fixed concepts and into a closer proximity with reality—what Buddhist teachings call “nonconceptual awareness.” Experiencing the natural world with nonconceptual awareness means that, rather than seeing a [small] black bird and thinking, “That’s a starling, a nonnative bird introduced from England several centuries ago,” we stop and see each particular bird’s incandescent blue-black velvet feathers, piercing amber eyes, and delicate, wiry feet. Instead of encountering the world through a filter of ideas, memories, and labels, we connect deeply with the unfiltered and vital pulse of life in that moment. Just stay safe out there. This time of year, birders get to see their hobby/sport/lifestyle in mainstream media, thanks to coverage of the Christmas Bird Count. The 109th count began Sunday, Dec. 14, and will continue to Monday, Jan. 5, 2009. According to National Audubon Society's CBC FAQs page, thousands of volunteers in the Western Hemisphere dedicate 24 hours to identifying species and counting birds within a 15-mile count circle. The predetermined circles are covered by birders who report to a count compiler before the circle's count date and pay the $5 participation fee. The Unity Christmas bird count occurred last Monday with mostly cloudy skies, an inch of old snow, blustery wind, and temperatures warming from 4 degrees at midnight to a gentle rain after dark. Although all the tallies are not yet final, the preliminary numbers indicate 25 birders reported 48 species. The days at the end of the year — filled with the holiday rush of shopping, parties of all sorts and family commitments — offer scant opportunities to get afield and look for birds. Off in the distance, with the Atlantic City skyline piercing through a cloudy midafternoon sky, the focus is out at sea, where hundreds of birds have gathered. Trudging along the trails of Silver Lake Nature Center Saturday on the annual Christmas bird count, the center's director-naturalist Bob Mercer didn't necessarily need his eyes to do the job. Pausing along a path in Todd Nature Reserve in Buffalo Township, something caught George Reese's eye in a stand of hemlock trees. "There's a grouse," Reese said above the low roar of nearby Hesselgesser's Run. 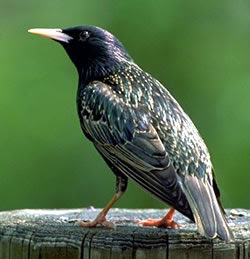 About 150 nature enthusiasts braved temperatures around -11 C yesterday to count thousands of birds in the London area. Citizen scientists spotted more than 60 species within a 12-kilometre radius of Reservoir Park on Commissioners Road during the 100th annual Christmas bird count, said Pete Read. A bright pink pillar of light rose in the eastern sky Dec. 14 and allowed itself to be spread out in layers of rose and gold by the southwest wind. It was a good beginning for the annual Woodhouse Township Christmas Bird Count. Last year, Betty Chanyi and I woke to drifting, blowing snow... and chickened out. It's one of the few times either of us has missed the count. While most teenage boys were out chasing girls, Sandy Pangle spent his high school days chasing birds. Bird-lovers in Middle Georgia made their way outdoors Saturday for the annual Christmas Bird Count, a nation wide “citizen-science” effort sponsored by the National Audubon Society. In Macon, some 30 people took part this year in the more than 100-year-old tradition that seeks to annually catalog the number of birds and bird species in a given area, said Marie Amerson, with the Ocmulgee Audubon Society. This year set a local record for participation in the event, Amerson said, even though they did not find quite as many birds as in previous years. Cold and windy weather didn’t keep nature lovers away from the Christmas Bird Count on Saturday at Martin Park Nature Center in Oklahoma City. 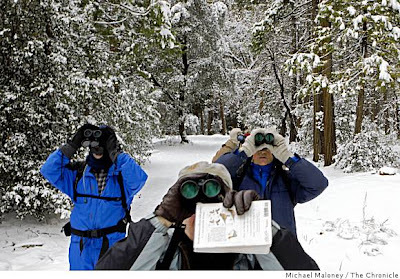 Volunteers and friends came bundled up and carrying binoculars to participate in the annual winter songbird census. Area bird watchers gathered at Granite Construction's Talmage operation about 7:15 a.m. Saturday to count birds as part of a yearly Christmas bird count. Cold temperatures frosted Ukiah Valley's floor, but wearing gloves and warm clothing local Audubon chapter members focused on counting birds. The screaming northeaster almost stopped our breath as we headed into it on our way to Little Spit Point at Sandspit. There was no shelter, neither for us nor for the birds. The wind chill brought the temperature down to minus 22c and it was no place for the faint-hearted. At the Cape May National Wildlife Refuge, situated beneath one of North America's premier migratory bird flyways, every new parcel of land is as important as the center square in a patchwork quilt. This month, 437 more acres of grasslands, salt marshes and forests were purchased by government agencies and conservation groups and added to properties that have been pieced together like scraps of fabric since 1989. The latest acquisition, along Bidwell Creek in the southern part of the refuge, expands the wildlife refuge to 11,496 acres across Dennis, Lower, Middle and Upper Townships in Cape May County. The price was $6.8 million, bringing the total cost of refuge property to $27.2 million. That this naturalists' paradise, which offers miles of unspoiled vistas on the coastal plain, exists on the Cape May peninsula is miraculous, say preservationists. Shrinking wildlife habitat means Audubon Society birders are counting fewer birds on Hilton Head Island than they have in the past, a trend reflected all over the world. While the number of local species has hovered around 150 since the 1970s, the total number of birds has continually declined, said Barry Lowes of the Hilton Head Audubon Society. 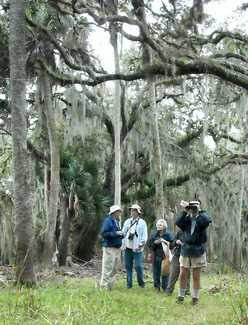 The local group completed its annual Christmas Bird Count last week. On a gloomy day that seemed to be twilight throughout the daylight hours, 31 observers took to the field on Dec. 14 for the Presqu'ile-Brighton Christmas Bird Count. In total, 22,726 birds of 76 species were found during the day. A bevy of birds and waves of nasty weather kicked off the opening week of Christmas Bird Counts in Northeast Ohio. With so many birders in the field, good sightings could be expected, even with the predictable rainy, gray and frigid conditions of mid-December. Two sleek ducks, streaks of black and white, flew in across the Winooski River from Burlington, riding the south wind and the smell of doughnuts frying at the Koffee Kup bakery. The 40 experienced bird watchers who spent Sunday recording virtually anything that flew as part of the 79th annual Cape Ann Christmas Bird Count, logged 47,000 birds in 123 species — including some interesting finds. Over 100 birders braved the cold, windy weather Monday to count 234 species of birds in the 16th Annual Matagorda County Mad Island Marsh Christmas Bird Count. Participants in the annual Whistler Christmas Bird Count have seen some tough conditions over the past 19 years, but this year’s Christmas count on Monday, Dec. 15 ranks as one of the toughest, with freezing temperatures and high winds sending birds into hiding. Cold weather was likely the factor that reduced the number of species naturalists observed during this week's 41st annual Prince George Christmas Bird Count. A Florida regional water board on Tuesday approved a $1.34 billion agreement to buy 180,000 acres of land from U.S. Sugar Corp, a deal regarded as critical to the restoration of Florida's fragile Everglades wetland. The South Florida Water Management District board of directors voted 4-3 to accept the landmark deal but amended it with an extra financial safeguard that put the contract "back in U.S. Sugar Corporation's court," district spokesman Randy Smith said. However, in a statement issued late on Tuesday, U.S. Sugar hailed the vote and called the amendment "non-material." "This is a monumental opportunity to save the Everglades, and after many months of negotiations, we can now move forward," Senior Vice President Robert Coker said. The state of Florida first announced in June that it had struck a $1.75 billion deal to buy all of U.S. Sugar Corp, one of the nation's largest privately held agriculture firms. 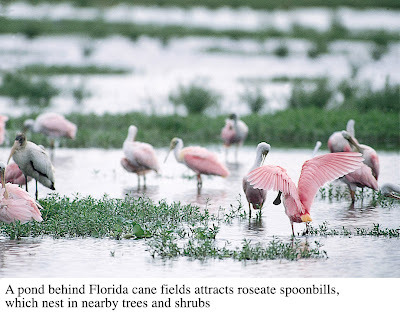 But in November state officials said they had scaled back the agreement and would buy only 181,000 acres of land which are considered critical to the restoration of the Everglades. Lakewood Ranch Herald, Bradenton, Fla.
Two California Condor chicks fledged from their nests in the Grand Canyon in December, bringing the world’s population of endangered California Condors now flying free in the wild to 169. 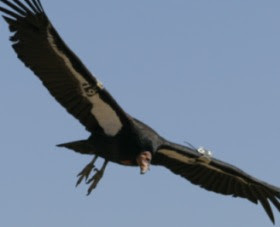 This is the first year that there are more condors flying free than are in captivity for breeding purposes. Fabulous news. Here's an update, posted in early November, about the condors in Arizona. Today President-elect Barack Obama announced his choices for his energy and environment team. He named Carol Browner -- who currently chairs the board of directors of National Audubon Society -- to "a newly created position to coordinate energy and climate policy." In this new post, Browner will direct the efforts of numerous federal agencies, including the Department of Energy, the EPA, the Transportation Department, the Interior Department, the Defense Department and the Commerce Department. Obama's first year in office will likely see action on at least three energy and climate fronts - a stimulus bill that contains major funding for mass transit, utility upgrades, and renewable energy development; a separate energy bill that contains more funding for renewable energy and possibly tighter fuel-efficiency standards; and a bill mandating a reduction in greenhouse gasses. Browner, a skilled Washington insider, will likely be spearheading the political effort to get these policies enacted. A lawyer by training, Browner headed the EPA under President Clinton from 1993 to 2000. She gained a reputation for forging compromises between environmental and business interests. Earlier in her career, Browner worked as a legislative aide to the late Sen. Lawton Chiles of Florida and as an aide to then-Sen. Al Gore. Since 2001, Browner has worked at the Albright Group, a Washington, D.C.-based consultancy set up by former Secretary of State Madeleine Albright. She also sits on the board of the National Audubon Society. Carol Browner is an outstanding choice to direct the integration of energy and environmental policy and to reposition the U.S. as a leader in addressing global warming. No one is better suited to addressing these challenges than Carol Browner. 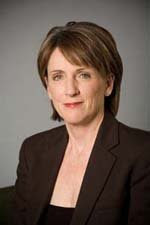 As the very successful and longest serving administrator of the EPA, Carol Browner has a proven track record of success. She is a skilled and pragmatic leader who gets results. The data collected by the birders helps researchers, biologists and other individuals study bird species' long-term health. 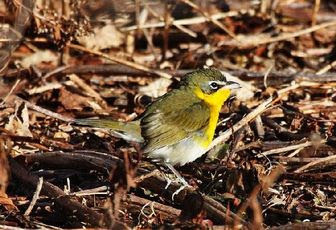 Researchers can combine the CBC data with Breeding Bird Survey data to better understand species' behavior, and the data can generate reports, such as Common Birds in Decline and Watchlist 2007. The Epoch Times, New York, N.Y. The Sacramento Bee, Sacramento, Calif.
Rogers, a logistics officer with the 371st Sustainment Brigade, was sent to the largest air base in Iraq in July. Although the country is only a war zone to many people, it represents something else to Rogers. He sees it as an opportunity to study species he's never seen. Within a month, he had published the first of his online newsletters to educate (and entertain) fellow troops and people back in the United States about the plants, animals and insects he and others spot in Anbar province. Rogers publishes "Al Asad au Natural" every few weeks. From the base northwest of Baghdad and near the town Khan Al Baghdadi, Rogers works with Nature Iraq, a nongovernmental environmental group. 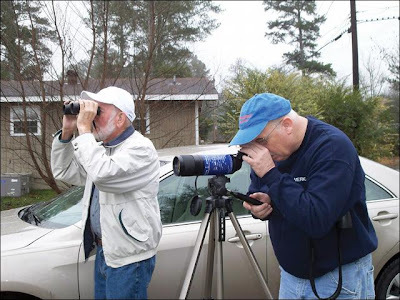 Back in Ohio, the Ohio Ornithological Society is raising funds for cameras, binoculars and books about birds, plants, trees and flowers for Nature Iraq. Don't we all, at some point, feel the way this bird looks? The event’s short-term goal is to educate Southland shoppers to adopt more sustainable practices during the holidays and coming year. The event’s long-term goal is to reduce the use of single-use plastic bags throughout California by empowering shoppers, and the community at large, to take simple and direct actions to eliminate unsightly debris and save taxpayer dollars. More than 6 billion plastic bags are used in L.A. County each year. Disposable bags cost our fiscally strained cities up to 17 cents per bag for disposal (this does not even include the environmental costs). Plastic bags are made from fossil fuels. Americans use over 380 billion bags every year, throwing away this precious, non-renewable resource. Does your community have a program similar to "A Day Without a Bag"? I knew plenty of guys like that. My own father had been one. Not that he had ever played golf. He watched birds. He had been in most countries of the world, and he had seen a lot of birds. Have you had any unexpected sightings recently? 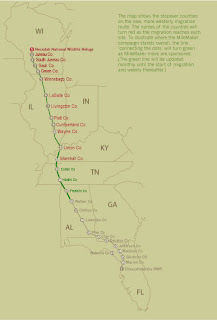 Fourteen endangered cranes made it to Hardin County, Tenn., today during their migration from Wisconsin to Florida. Led by four ultralight aircraft, the crane chicks left Necedah National Wildlife Refuge on Oct. 17. Their final destinations are Chassahowitzka and St. Marks national wildlife refuges. The Whooping Crane Eastern Partnership coordinates the eight-year effort to reintroduce the endangered species in eastern North America. 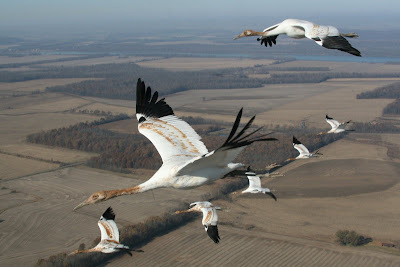 Currently 68 migratory Whooping Cranes live in the region. "This is an exciting year for the reintroduction project with the addition of St. Marks National Wildlife Refuge in the Florida panhandle," said Sam D. Hamilton, Southeast Regional Director for the U.S. Fish and Wildlife Service. "We wish the intrepid pilots of Operation Migration all the best with the new route as they enter the Southeast, and hope for a safe and speedy arrival at St. Marks and Chassahowitzka National Wildlife Refuge." that President Bush pardoned Leslie Owen Collier, convicted of killing Bald Eagles when the raptors died after consuming pesticide-laced coyote carcasses? The 1995 incident that changed the life of the farmer from the Charleston area of southeastern Missouri began when he noticed an increasing number of wild turkeys, which were believed to have died away. "I got it in my head that if I eliminated some of the coyotes it would give the turkeys a jump-start," on their comeback, Collier said. So he put out hamburger meat laced with the pesticide Furadan in an effort to kill the coyotes. It worked; seven coyotes died. The problem occurred when the eagles fed on the coyotes' carcasses. They died, too. So did a red-tailed hawk and a great horned owl, among other animals. The birds are federally protected and killing them is illegal. Collier said the crime became a felony when the second eagle died. He pleaded guilty in late 1995 and received two years of probation. So Black and other supporters began writing letters seeking a pardon. Several months ago, U.S. Attorney Catherine Hanaway contacted Black and requested the full story. Hanaway had been asked by a pardon attorney for the Department of Justice for input about the possibility of a pardon. Hanaway said she spoke with federal prosecutors familiar with the case, with the judge, even with people in the Charleston area who know Collier. "By all accounts ... he is a pillar of the community down there," she said. that Connie Kogler, a WildBird Birder of the Year candidate, appeared in a "New York Times" article on Nov. 27? The article focuses on Project FeederWatch, which began Nov. 8 and will continue into April. It's not too late to sign up for the citizen-science project. that the Nov. 15 fire in Corona, Calif. -- known as the Freeway Complex fire -- burned more than 95 percent of Chino Hills State Park? The park's 14,100 acres used to provide habitat for 200 bird species, including the endangered Bell's Vireo subspecies (Vireo bellii pusillus). A photo gallery from the article appears here.